High profile disasters like the 2017 Grenfell and 2014 Lacrosse tower fires, the causes of which were traced to non-compliant flammable cladding, have placed the design and building industry under close scrutiny. The cost of non-compliance can be astronomical, from increased risk of accidents and building damage to building compliance failure and the need for full remediation or replacement. The Lacrosse fire in Melbourne alone caused $40 million worth of damage, and an estimated $15 million to remediate the non-compliant cladding. Yet despite these risks, non-conforming and non-compliant products remain in use. The challenge for designers and specifiers is to keep well-informed of the performance profiles of building products and their intended applications as well as with Australian’s complex web of building regulation, which is trending towards tightening controls across the industry. Professionals can address this issue by identifying trusted manufacturers and suppliers who can demonstrate a stringent and robust product testing process and prove compliance with the requirements of Volumes One and Two of the National Construction Code, also known as the Building Code of Australia (BCA). Innowood have made the path to compliance easier with the announcement of the official CodeMark certification of InnoClad and InnoScreen by CertMark International (CMI), an accredited certification body under ISO 17065. The CodeMark Certification Scheme is a certification scheme that authorises the use of building products under specific circumstances to facilitate compliance with the BCA. A nationally recognised scheme, Codemark certification is one of the pathways to fulfilment of the ‘Evidence of Suitability’ requirements under the BCA. Codemark certification is recognised under State and Territory building control legislation, meaning products that have received CodeMark certification are accepted as having been subject to third-party assessment. The CodeMark certification process examines the product, how the product is used, and the installation process to determine the application of the product. The CodeMark scheme reviews the entire system surrounding the product to confirm its compliance with the BCA. By obtaining CodeMark certification, Innowood products have been assessed for compliance and have the backing of regulatory authorities in Australia. InnoClad is a low VOC, 100% recyclable composite wood cladding product designed for residential and commercial applications. 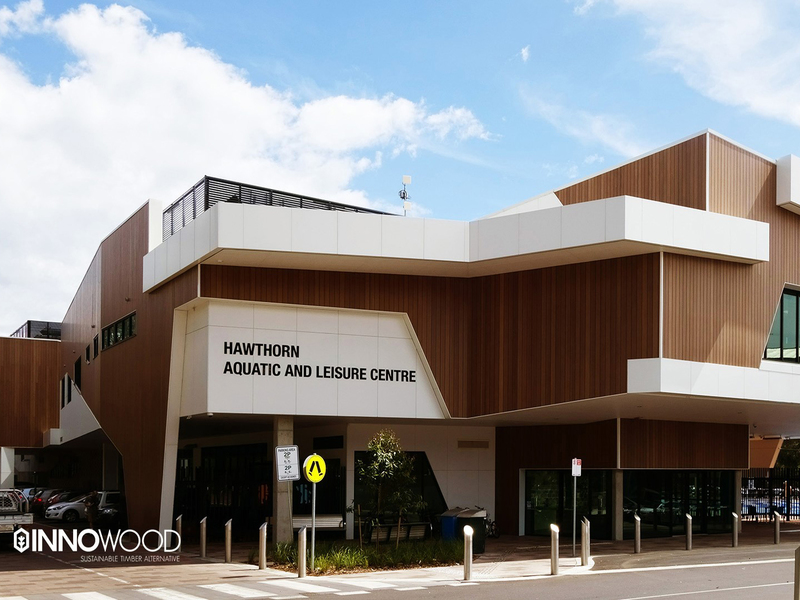 Available in a wide variety of colours, this architectural composite wood cladding system enhances outdoor façades with the warmth and character of natural timber. Providing maximum design flexibility, the InnoClad system comes in a variety of widths that can be orientated either vertically or horizontally, delivering a clean finish with evenly spaced shadow lines. Lightweight and superior acoustic performance, InnoClad is also ideal for internal lining applications. With the look and feel of natural timber, InnoClad can add style and warmth to interiors while also delivering performance and functionality. InnoScreen is a flexible, versatile alternative to conventional façades designs. Available in a variety of colours, Innoscreen can elevate various types of construction surfaces including conventional wall, soffit or ceiling treatment with the organic quality of natural timber. To create unique design elements and features, the InnoScreen system can be arranged vertically or horizontally withvarying profiles and pitches. InnoScreen can fulfil multiple functions and can be used to create shade, optimise natural light or provide privacy and security. Lightweight and easy to install, InnoScreen provides a solution that can meet most aesthetic requirements, performance requirements and installation cost requirements. These Innowood products have been CodeMark certified for use both internally and externally InnoClad and InnoScreen have been certified to meet a number of performance requirements in the BCA relating to damp and weatherproofing, construction in fire prone areas and fire safety and deemed-to-satisfy provisions regarding fire hazard properties. In addition to the standard formulation that has been tested to AS1530.3, Innowood products can also achieve higher specific fire ratings upon request and These performance formulations can achieve a Group 1 rating (ASNZS 3837 – Specification A2.4 of BCA) or up to BAL- 29 Rating (AS3959:2009 – Construction of Building in Bushfire Prone Areas, Appendix F). Innowood composite timber alternatives are sustainable and durable. With low VOC emissions, Innowood products are non-toxic and safe for end users. 100% recyclable and with excellent thermal properties, Innowood products deliver energy efficiency while minimising harm to the environment and reducing waste. Innowood products are durable and resistant to cracking, splitting and swelling as well as termite infestation, mildew and water damage. Since 2005, Innowood has been the market leader in innovative composite timber solutions. Committed to continuous improvement, Innowood is at the forefront of product performance and design, and is constantly working to improve the finishes, lifespan and colour durability of their products. Specified across the globe, Innowood is one the most trusted and recognised brands in the architecture and design industry. Innowood creates sustainable and environmentally friendly products ideal for today’s challenging built environments. For more information about InnoClad and InnoScreen, visit the Innowood website at https://innowood.com.